Maybe your golf game is up to par on the course, but how would your wife or husband say you are doing when you are at home. Many of our customers have been looking for an attractive and inexpensive way to organize their golf equipment. The Golf Organizer provides an easy, quick and affordable way to organize your golf equipment. The product is completely stand alone and does not require any other garage storage systems. You won’t have to hunt throughout the house for your golfing items when you have the Golf Organizer! 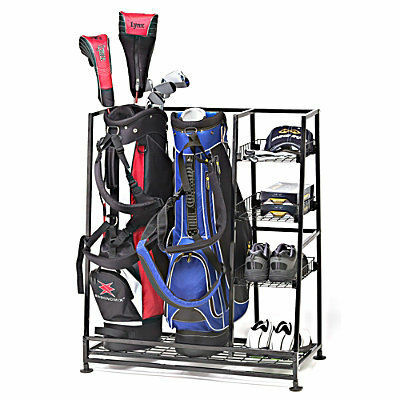 This lightweight golf bag organizer is an attractive and compact storage rack that fits neatly against a wall in your garage, basement or even your family room. Made of tubular steel, the Golf Organizer is powder-coated to resist rust so it’ll keep its good looks for years. The Golf Organizer holds two fully stocked golf bags and also has four shelves. Use the metal trays of the golf bag organizer for accessories, shoes, hats, shirts or towels. 34 Inches Wide x 16 inches deep x 37 inches high.